How many planets like the Earth are there among the 130 or so known planetary systems beyond our own? How many of these "Earths" could be habitable? 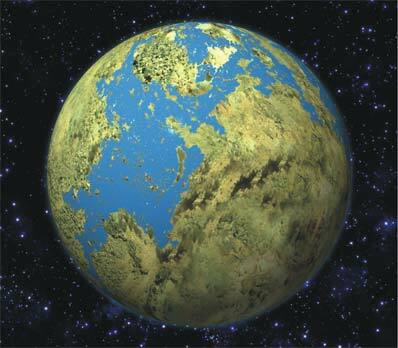 An artist's impression shows an Earth-like planet. Credit: Julian Baum/Take 27 Ltd. Recent theoretical work by Barrie Jones, Nick Sleep, and David Underwood at the Open University in Milton Keynes indicates that as many as half of the known systems could be harbouring habitable "Earths" today. Unfortunately, existing telescopes are not powerful enough to see these relatively small, distant "Earths". Orbiting close to a much brighter star, these very faint worlds resemble glow-worms hidden in the glare of a searchlight. All of the planets that have been detected so far are giants the mass of Neptune or larger. Even so, they cannot be directly seen with ground-based instruments. Almost all of the known exoplanets have been found through the "wobbling" motion they induce in their star as they orbit it, like a twirling dumb-bell in which the mass at one end (the star) is much greater than the mass at the other end (the giant planet). Speaking today at the RAS National Astronomy Meeting in Birmingham, Professor Jones explained how his team used computer models to see if "Earths" could be present in any of the currently known exoplanetary systems, and whether the gravitational buffeting from one or more giant planets in those systems would have torn them out of their orbits. "We were particularly interested in the possible survival of "Earths" in the habitable zone," said Professor Jones. "This is often called the 'Goldilocks zone,' where the temperature of an 'Earth' is just right for water to be liquid at its surface. If liquid water can exist, so could life as we know it." The Open University team created a mathematical model of a known exoplanetary system, with its star and giant planet(s), then launched an Earth-sized planet at some distance from the star to see if it survived. By detailed study of a few representative exoplanetary systems, they found that each giant planet is accompanied by two "disaster zones" - one exterior to the giant, and one interior. Within these zones, the giant's gravity will cause a catastrophic change in the Earth-like planet's orbit. The dramatic outcome is a collision with either the giant planet or the star, or ejection into the cold outer reaches of the system. The team found that the locations of these disaster zones depend not only on the mass of the giant planet (a well known result) but also on the eccentricity of its orbit. They thus established rules for determining the extent of the disaster zone. Having found the rules, they applied them to all of the known exoplanetary systems - a much quicker method than studying each system in detail. The range of distances from the star covered by its habitable zone was compared to the locations of the disaster zones to see if there was a full or partial safe haven for an Earth-like planet. They discovered that about half of the known exoplanetary systems offer a safe haven for a period extending from the present into the past that is at least long enough for life to have developed on any such planets. This assumes that "Earths" could have formed in the first place, which seems quite likely. However, the situation is complicated by the fact that the habitable zone migrates outwards as the star ages, and in some cases this changes the potential for life to evolve. Thus, in some cases a safe haven might have been available only in the past, while in other cases it might exist only in the future. A paper by Barrie W. Jones, David R. Underwood, and P. Nick Sleep, entitled "Prospects for habitable 'Earths'," is scheduled to appear in the 1 April 2005 issue of the Astrophysical Journal.